Let’s start with the general appearance of this interesting plant, and after that we’ll look a bit closer at some fascinating details. The first impression is that we look at a Colchicum, and that is not so strange, because both Colchicum and Androcymbium belong to the Colchicaceae. The leaf rosettes of A.rechingeri-plants look like Colchicum pusillum Sieber, found in Eastern - Crete and Karpathos and are sometimes mistaken with these; that is, until they flower. 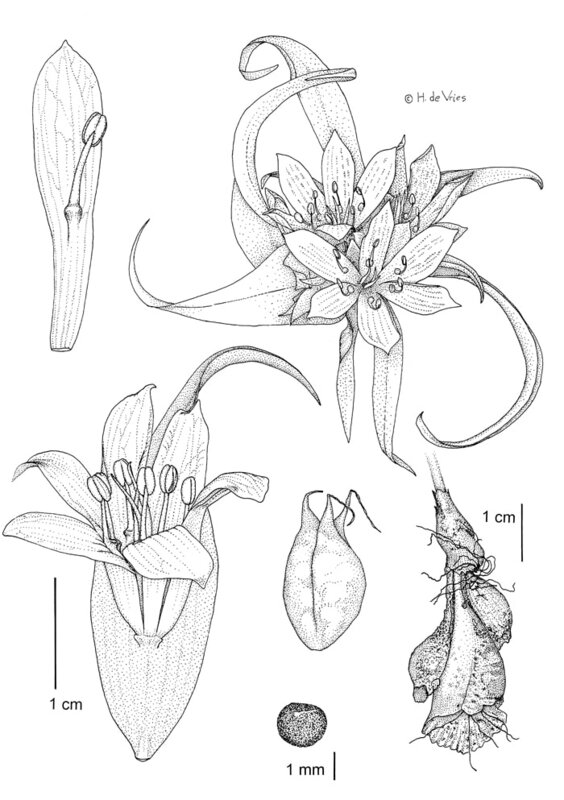 Androcymbium rechingeri is clearly related to the south-and east-Mediterranean species of Androcymbium (like A.gramineum (= A.europaeum) and A.palaestinum). they are ‘sitting’ in the middle of the leaf (well, in the middle of this ‘extended bract’), on a very very short pedicel. And this is extremely rare indeed, only very few European plants are known with the flowers sitting in the middle of (what looks like) a leaf ! Oke, here is the other one: Ruscus aculeatus (in this case what looks like a leaf is in reality a branch, and I’ll come back to that species later). But that is not all ! The base of the stamen is united with the tepal, so that it seems that the stamen is sitting in the middle of the perianth segment. At the base of the stamen is a nectary. This should indicate that Androcymbium needs insects for pollination, but this seems to me a little confusing because it flowers around December. The nectaries are quite active: there is always a drop of a very sticky fluid (probably sugar-water) or, a little later, a clump of sand glued on the nectaries. So far for the leaves, now let’s dig somewhat deeper. And that’s underground. Androcymbium plants have a tunicated corm, similar in appearance to the familiar tulip bulbs (but in Androcymbium they are not bulbs but corms !!!). A corm is a short, swollen underground stem of a plant that stores food reserves to enable the plant to survive adverse conditions, in the case of A.rechingeri summer drought and heat (estivation). A corm is typically surrounded by protective skins called tunics. These tunics consist of the old dead skin and in healthy plants the corm for next year is larger than the old tunic from last year, so after flowering, when a new larger corm is formed inside the old skin, this old tunic is pushed upwards where it meets the tunics of former years, pushing them up, the oldest and smallest tunic on top, the latest tunic at the bottom (see drawing). There is always only one flower on every “leave”. The pedicel of the flowers is very short, less than two millimeter. Because there is no apparent difference between the 3 petals and 3 sepals, the perianth segments are called tepals, and there are 6 of these tepals. The flowers can be up to 3 cm in diameter and in well developed flowers the tepals can be as long as 20 mm, with a width of 4 mm. Although the flowers look like they are campanulate, the perianth segments are divided down to their base without fusing into a tube. The flowers with their flat lamina are white and generally more or less striped with red-purper lines and dots at the base of the tepals. The anthers are yellow with a tiny black line on the back, the connective. The fruit is an ovoid capsule, with a papery skin. The seeds are more or less round with a grey-brown, rough testa, which is minutely warty.